This cycle route exits the city via Amstelveen, a linear post-war extension. It goes into the still-rural ‘Green Heart’ and returns to Amsterdam along the river Amstel, in its rural and urban settings. 42 km, 5 hours. Revised August 2018.
start in front of the former Heineken brewery (now ‘Heineken Experience’), at Stadhouders kade 78. This was a functioning brewery until the 1990’s. The canal in front is the former city moat (of the 17th-century city). The bends in this canal mark the position of the former bastions, they were removed in the late 19th century, when the brewery itself was built. facing the canal, turn right along the Stadhouders kade. Turn right at the next corner, into 1e (Eerste) van der Helst straat. This district, De Pijp, is a 19th-century expansion – in fact a classic example of 19th century urban growth in Dutch cities. The houses in the side streets are typical of that period, but many have been replaced by urban-renewal infill. Most of the brewery site has also been redeveloped, and the area is gentrifying rapidly. at the small ‘square’ Gerard Dou plein, go diagonally left, into the continuation of the Eerste van der Helst straat. Step off your bike here – fines for cycling. cross the Albert Cuyp straat, the best known street market in the Netherlands (Monday to Saturday, until late afternoon). go straight on: at the corner of Eerste Jan Steen straat, you can cycle again. Go straight on, past Sarphati park. cross the Ceintuur baan, a 19th-century ring road, the route of tram line 3. The houses are of better quality than those in the first side streets. continue along 2e (Tweede) van der Helst straat. At the square (Van der Helst plein), go to the right, around the square, into the continuation of the Tweede van der Helst straat. at the next corner, turn right into Lutma straat. Cycle on across the Ferdinand Bol straat, the route of tram 12.
pass through the square Cornelis Troost plein, then go to the left toward the church tower, into Pijnacker straat. at the church turn right, along the van Hilligaert straat. Cross a canal, toward the petrol station. go on past the petrol station. As you pass it, just before the next bridge, turn right, along the tree-lined canal, along Reynier Vinkeles kade. The expensive canalside houses form part of Plan Zuid, the 1920’s expansion of Amsterdam designed by H. P. Berlage. cross a tramline (lines 5 and 24), and continue along Reynier Vinkeles kade. Construction work early 2019: go left around the construction work, then continue along Reynier Vinkeles kade. at the next bridge, the canalside street ends: turn left across the bridge here. The incongruous and ugly building is the Amsterdam Hilton. at the next traffic lights cross a broad avenue, Apollo laan. On the other side is an office building at nr 151: turn right, passing its entrance. At the corner, turn left into another broad avenue, Minerva laan. Minerva laan is aligned north-south, and extends to the site of the ‘southern station’ in the 1920’s Plan Zuid. It was intended as a grand entrance avenue to Amsterdam: the Hilton site would have been occupied by a public building. cross Minerva plein, surrounded by 1930’s apartment blocks, and continue along Minerva laan. at the next canal, cross the cycle bridge. The Second World War interrupted the completion of Plan Zuid and its successor, the AUP of 1935.
go straight on towards the office buildings ahead. Minerva laan still has a broad central reservation, but it is lined with suburban houses with gardens. These houses were built when the ‘southern station’ was delayed for 50 years. Amsterdam-Zuid station finally opened in 1981, together with a cut-off line to Leiden via Schiphol airport. In the 1980’s it was designated as an employment zone, one of several along the ring motorway. Development later stagnated, but restarted in the late 1990’s, and is now on a much larger scale. at the end of Minerva laan, go straight on, passing a new underground bike park. Go under a low road viaduct, into a pedestrian area. pass the entrance to another underground bike park (Fietspunt). Step off your bike here, and walk through the station. The station hall is under the ring motorway: the rail line and metro are in the central reservation of the motorway. There were plans to put everything underground, but it was too expensive, so only the motorway will be in tunnel. The station will stay where it is, more or less. Since July 2018 it is the terminus of the new north-south metro line. leave the station by the narrow south exit to Mahler plein. Keep to the right in the square, go toward the twin yellow/brown office towers ahead. go straight on, along the cycle path, on the right-hand side of the yellow/brown towers. Cross the new yellow-brick footbridge. at the older flats, turn right. Continue, parallel to the flats, toward the Vrije Universiteit (VU) campus. The VU is the second university of Amsterdam, with an orthodox-Protestant tradition. Many European universities relocated to suburban campus sites in the 1960’s and 1970’s, as student numbers expanded. Tracks were shared by tram and metro, but the metro closed in March 2019. The tram is still running, but the line is being gradually rebuilt as an express tram line. The line serves the Amstelveen extension of Amsterdam. Planning in the 1950’s included urban extensions in the form of ‘fingers’, a version of a famous Copenhagen plan. Between the fingers would be wedges of open space. This extension has retained the intended linear character, and has about 100 000 inhabitants, almost all in post-war housing. It is named after the small village of Amstelveen, which you pass later. at the next tram stop, pass a cluster of shops, typical of 1950’s and 1960’s planning. These small clusters were built for a lifestyle, where the housewife walked to the shops to do the family shopping. The effect of motorisation on the scale of retailing, was not appreciated until later. Until 2016 this cluster still had a baker, a butcher, and a greengrocer, but they all closed or moved. Further on, there is a larger cluster of shops. The canal is the boundary of the municipality of Amstelveen. These transverse canals are remnants of the former landscape – polders with drainage canals running almost exactly east-west, to the Amstel river. as the road drops, turn next right into Hoeksewaard. This is a diversionary route, since the cycle path ahead is closed for construction work. Follow the small yellow diversion signs for cyclists. pass a block of flats, and turn next left into Henegouwse laan. Go straight on to the end of this street. pass another cluster of local shops. At the roundabout just after the shops, go straight on, along Rembrandt weg. after 800 m the street curves slightly right, approaching the ‘city centre’ of Amstelveen. Continue into the central square, Stadsplein. Ahead is the new cultural centre, with theatre and a concert venue. The street still has a street market on some days, but most shops are now in enclosed mall. Most of the new buildings are infill, built on the oversized central square of the 1960’s development. In the 1950’s, planners decided not to expand the old village core, but to build a new centre here. It is now the top-level retail centre for Amstelveen itself, and for surrounding commuter villages. To the south, the next comparable centres are Leiden and Utrecht. C. Dijkstra, M. Reitsma, A Rommerts. Series published by the Provincie Noord-Holland. cross the square diagonally right, and exit at the right end of the cultural centre. Go on past the ANWB shop, to the traffic lights. (This shop sells cycle maps). at the traffic lights, cross toward the new Cobra Museum voor Moderne Kunst (on your right). This art museum was built to add class to the suburban retail development. at the corner of the museum, turn left across the main road (Keizer Karel weg). on the other side, go slightly left, and then into the first street of houses-with-gardens, Thorbecke laan. go along Thorbecke laan, past several side streets. At the open space, turn left, along Mr. F. A. van Hall weg. turn left, following the cycle sign for Schiphol, across the track. The cycle path is split, with the rail track in the middle. You cross the busy A9 motorway (Alkmaar – Haarlem – Schiphol – Amstelveen – Utrecht). It follows the line of the Haarlem-Hilversum provincial highway built in the 1930’s – the first ‘tangential’ infrastructure in the region. This section will be replaced by a tunnel, planned to open in 2024.
continue along the cycle path, to the old station of Amstelveen. Built in 1912, it still has the station name in tile above the entrance. A network of local rail lines was built south and west of Amsterdam between 1912 and 1918. The line to Amstelveen was opened in 1915: it split about 1 km south of here, and continued to Aalsmeer and Uithoorn. From Aalsmeer there was another branch to Leiden, the Uithoorn branch continued to connect with the Utrecht main line. In a few places the lines encouraged suburban development. If they had developed into a full commuter network, the regional structure would be quite different. Instead they were closed by 1950.
at the old station turn right, along Stations straat. At the end, turn left along Dorps straat, the village street of Amstelveen. The line of the street itself is probably the oldest surviving heritage here: a centuries-old road from Amsterdam to Leiden. At nr. 75 is the old Town Hall, one of the few ‘original buildings’ (built 1896, so it is not very old anyway). The village was destroyed by fire in 1792, and most of the mainly 19th-century houses were demolished after 1950. In 1963, the council decided to demolish the entire village core. That was before Europe discovered Heritage: in 1977, the council decided to rebuild it. go straight on along the cycle path. Ahead is a level crossing of the old rail line. just before the level crossing, turn right across the road, and go along the restaurant access road, toward the water visible 100 m ahead. cycle slowly, because the path ends on a wooden jetty in a lake, with no warning sign. This is the Amstelveense Poel, a lake created by deep turf cutting. 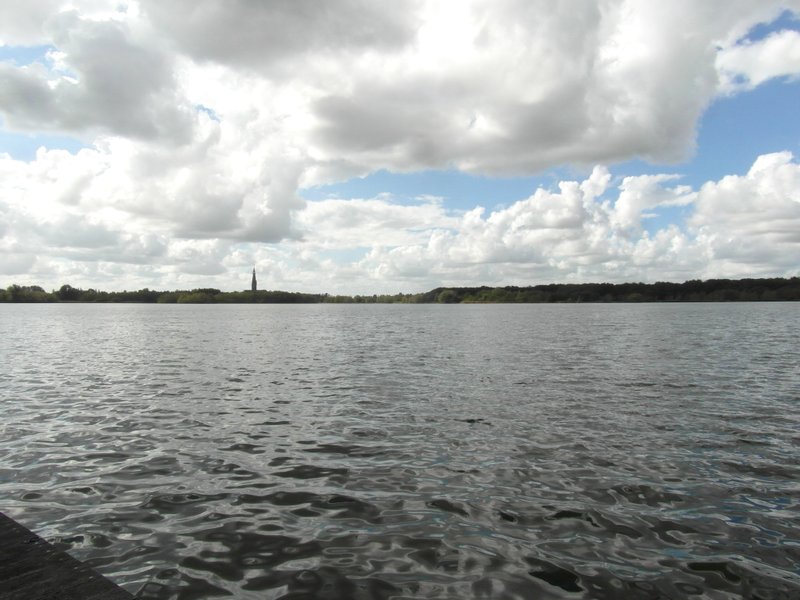 Between 1400 and 1920, almost all land between the Amstel river and the Haarlemmermeer lake was cut away for turf. At first the turf was cut on the surface, but after 1600 it was cut underwater. No advanced technology was needed – simply a boat, and a spade with a long handle. That left a lake: most were reclaimed again by 1900. (The present soil in those polders is the underlying clay, 4 or 5 meters under sea level). On your right the present town hall of Amstelveen. The church tower on the left is at Bovenkerk, a hamlet which suburbanised at the same time as Amstelveen. turn back from the jetty. Cross the road again, to the cycle path, and turn right, crossing the rail line. 15 m further, turn left into the cycle path, toward the curved apartment block. follow the cycle path down. At the street (Kastanje laan, no sign here), turn right. 650 m further, at the roundabout, turn right along Van der Hoop laan, past the shops. at the next roundabout, cross the Sportlaan, go on past a sports centre. at the next traffic lights, continue along Van der Hoop laan – but cross the road, and use the cycle path on the left-hand side. The route is easier to follow, if you switch here. cross the next traffic lights, continue along Poortwachter – still using the cycle path on the left-hand side of the road. the road Poortwachter bends to the right, you also turn right here. Then turn first left, into Grote Beer. the street bends left: just after the bend, turn off right into Brink. pass the anti-cycling barrier, and walk along the footpath, to the corner of this block. This is the local shopping centre Middenhoven: it faces the now-closed light metro station. cross the road and the tracks, and go slightly left into the cycle path, at the sign ‘Dr. Willem Dreesweg 416-422’. The path parallels a decorative watercourse, with some wooden bridges. follow this path along the watercourse: don’t turn off into the housing. The path then crosses a wooden bridge, and you cycle toward the open land ahead. 200 m further, you reach Nesser laan: you are now in open polder landscape with grazing Frisian cattle (sheep in winter). Nesser laan is a polder access road, with some surviving farm buildings. Ahead of you is the rest of the Bovenkerker polder, reclaimed around 1770. Diagonally left is the church tower of Nes aan de Amstel. Visible ahead is Uithoorn, 4 km away, with about 25 000 inhabitants. Since the 1960’s there are vague plans to extend Amstelveen across the polder, to join with Uithoorn. This is controversial because it is an extension into the ‘green heart’ of Holland – more on that issue later. To indicate the scale of the extension: Uithoorn is already one-quarter of the distance from central Amsterdam to central Rotterdam. turn left along Nesser laan. The housing of Amstelveen simply stops dead: such sharp urban edges are the result of strong planning controls. cycle on alongside a small drainage canal: visible ahead is the river dike of the Amstel river. The river originally ran through uninhabited peat bogs: they were settled in the Middle Ages, at first as farmland. The Bovenkerker polder is part of the secondary land reclamation, after turf cutting. pass an intermediate pump in the drainage canal (metal boxes on a wooden platform). The blue enamel water gauge here, shows that the water is 5,50 m under sea level. pass the ‘corner’ of Amstelveen: along its east side there is an equally sharp urban edge, the line of a planned Amsterdam-Rotterdam motorway. at the main pumping station, the road rises to the first dike. This is not the river dike: the water drains into an intermediate canal. This is the ring canal of the Bovenkerker polder. Water is pumped from polders into ring canals, and then another step into rivers or lakes – multiple water levels are characteristic of the Dutch polder landscape. instead of going directly to the river, turn right in the direction of Nes a/d Amstel, passing the pumping station. Cycle on alongside the ring canal. Four landscape elements are visible here: the river-dike, a strip of grassland about 100 to 300 m wide, the ring canal, and the regular ditches in the low-lying polder. Its depth is the result of turf-cutting: it had become a lake like the Amstelveense Poel, and was drained around 1765. Strips of higher ground were often left at the margin of the turf-cutting, called bovenlanden or ‘upper lands’. 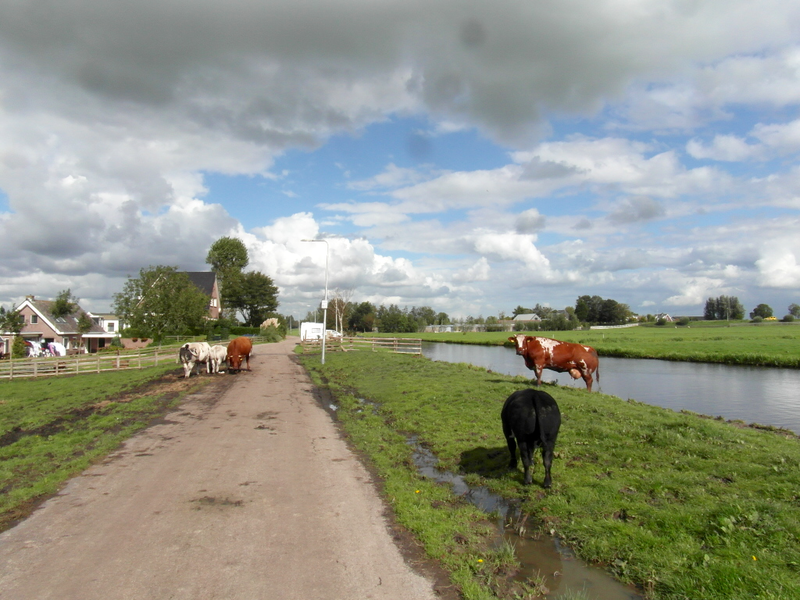 The grassland on the left is an example: it is about 3 m higher than the polder. after 300 m pass the remains of a windmill. There may be cattle on the road. Originally there were 10 windmills here, to drain the polder – the predecessors of the diesel pumps. approaching the village of Nes, cross the canal on a wooden cycle bridge. About 150 m further, stop at the open space on your left. go across the open space, toward the church. Go onto the basketball court, and turn toward the school playground gate, on your right. just before this gate, turn left along the footpath: it leads to the churchyard. You must step off your bike, to pass a barrier at the churchyard. go to the left around the church, passing the graveyard. The neo-gothic Catholic church was built in the 1890’s. exit the churchyard through the front gate, and turn right along the bank of the Amstel river. This is the river which gave its name to Amsterdam (Amstel-dam, mediaeval spelling Aemstelredam). Just after the church you pass a small statue of Aagje Deken and Betje Wolf, 18th-century literary figures. Aagje Deken was born in Nes. cycle along the dike, out of the small village (population 500). about 1 km after the church, opposite nr. 187, cross the river by a cable ferry. The ferry operates until 20.00, but in winter only until 18.00 on weekends and holidays. It costs just 70 cents. On the other side, you are in the Province of Utrecht. This is about half-way through the route, and you now turn back toward Amsterdam. cycle down from the dike, to the road behind (Waver dijk), and turn left. pass on the right Fort Waver-Amstel (built 1908-1912). It is part of the late 19th-century defence line, the Stelling van Amsterdam. The defence system was based on inundations: most of the polder behind the fort would have been deliberately flooded. Amsterdam would have been surrounded with an almost complete circle of shallow water, up to 10 km wide. The system was never tested, but it may have deterred a German invasion in World War I.
the road rises: cycle along the bank of the small Waver river, towards a white lifting bridge ahead. You are now looking back towards Amsterdam, the Amsterdam Arena stadium is the most prominent building. Beside it the cluster of offices around Bijlmer-Arena station. cross the white cycle bridge, and turn right. There is an information sign here, and a sign for Junction 1 of the local cycle route network. You are on the ring dike of De Ronde Hoep, a mediaeval polder – built between 1100 and 1300. Apart from the motorway across its northern tip, its structure is preserved (about 1000 hectares). It was originally peat bog, reclaimed from the dike inward. The centre is open, without a single building. To the right are the ‘Ronde Venen’, an approximately circular group of 19th century polders. This is the ‘Green Heart’, the still agricultural centre of the Randstad. The Randstad is the collective name for the ring of cities including Amsterdam, Haarlem, Leiden, The Hague, Delft, Rotterdam, Gouda, and Utrecht. Historically, this area is the core of the Netherlands state. Depending on the definition, the Randstad has about 7 million inhabitants, and yet there are cows grazing all around you. Now, what would happen here, if all planning controls were lifted? The disappearance of the Green Heart under urban sprawl was the classic nightmare of Netherlands planning. 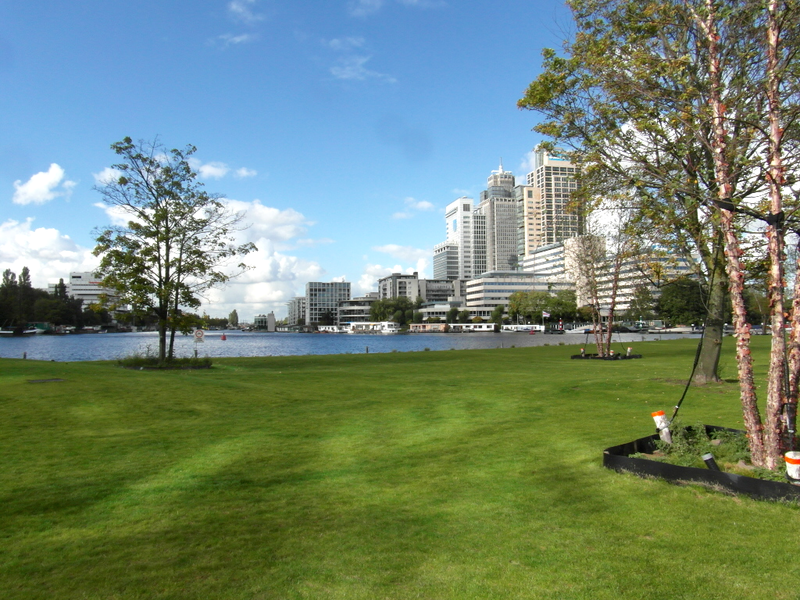 It is now fashionable for architects and planners to denounce the ‘Green Heart’ concept: some advocate its conversion to a landscaped park-suburb. 2 km along the dike, there is a lifting road bridge: turn right across it. Cycle about 300 m along Hoofd weg, to the last house. You can then look back at the pumping station. This is the main canal of the Polder Groot-Mijdrecht Noord. Like others in the area, this polder was reclaimed from peat bog, then cut away for turf, then abandoned, flooded, and reclaimed again. The second reclamation, in the 19th century, was only possible with steam pumps, since the turf-cutting had lowered the land (now 5-6 m under mean sea level). This polder is strictly speaking a droogmakerij – a ‘dry-makery’. It has a classic droogmakerij landscape, very regular in layout. The main road, ‘Hoofd weg’, runs due south along the main drainage canal, in fact National Grid line 122 runs exactly along the canal. The lateral roads are at 1 km intervals. Because it is so deep, brackish groundwater flows into the polder. Continual pumping extracts this groundwater near the surface. The ground then shrinks – about 8 mm per year – and the problem gets worse. The Province considering flooding of the polder but settled for a less ambitious plan with wetlands, after opposition from polder residents. turn back, back over the bridge, and then turn right, to continue along the dike of De Ronde Hoep. continue through the settlement of Waver, a cluster of houses rather than a village. It has no church – the traditional defining feature of a ‘village’ in the Netherlands. after another 2 km, you are diametrically opposite Nes aan de Amstel. Pass on the right a lifting bridge, Stokkelaars brug. Here the river Winkel joins the Waver (and they sell ice cream here in the summer). continue along the dike, passing the old pumping station (gemaal) behind nr 47. Beside it is the new pumping station, which now drains the Ronde Hoep polder. pass another lifting bridge, and Restaurant De Voetangel, and continue towards Ouderkerk. Here the river Holendrecht joins the Waver: they flow on with a new name, the Bullewijk. pass under the A9 motorway bridge into Ouderkerk aan de Amstel. Go on past new housing, pass a bridge, but cycle straight on along the river bank. pass on the opposite bank the Beth Haim cemetery of the ‘Portugese-Israelites’ of Amsterdam – funerals came here by boat. The cemetery dates from 1614, soon after the Sephardic community is recorded in Amsterdam. The cemetery is the probable site of the castle of the Lords of Amstel – no traces remain. Ouderkerk, not Amsterdam, was the central settlement of early mediaeval Amstelland, the region along the Amstel river. Around the year 1000 the settlement began, at the meeting of two semi-tidal creeks in marsh forest – the creek banks were slightly higher then the surrounding peat bog. Before the existence of Amsterdam was even recorded, the Lords of Amstel tried to carve out an independent princedom, between the territories of the Counts of Holland and the Bishop of Utrecht. They failed, and their castle was destroyed in 1204. The subsequent rise of Amsterdam gave them a mythical status, as predecessors of the city’s power. continue to the neo-gothic church ahead, beside the wooden lifting bridge into the village core of Ouderkerk. turn right over the bridge, and cycle along Kerk straat, ‘church street’. The street splits, but both are named Kerk straat: use the older section of street, to the left, with the shops. at the end of Kerk straat, at the town hall of Ouder-Amstel, turn left into the village street, Dorps straat. The Amstel is now on your left. the street continues as Hoger Einde Zuid. At the end of the village, cross the main road, go straight on into Hoger Einde Noord. After 300 m, you are on the right bank of the Amstel. pass the first of several 17th / 18th-century country houses. There were once about 60, along the Amstel and Vecht rivers. pass windmill De Zwaan, a polder drainage mill (1638). Further on, as you pass nr 12, there is a small obelisk on the opposite bank. It is a banpaal – a boundary marker of the city of Amsterdam. At one German mile (7,4 km) from the city gates, these obelisks marked the limit of city jurisdiction. Exiles who passed them, back into the jurisdiction, faced execution. cycle on towards Amsterdam, and pass on the opposite bank the ‘Rembrandt windmill’. Hundreds of tourists arrive here every day in summer. Rembrandt did indeed sketch here, and there is a statue of him sketching, but he never saw this windmill – it was moved here, from the other side of the city. 5 km after Ouderkerk, pass under the bridges of the ring motorway, the ring metro, and the Schiphol-Almere rail line. The area ahead is surprisingly undeveloped, with Volkstuinen, allotment gardens. The river bank itself is overgrown, there are houseboats behind the trees. There are plans to develop this area, but they are strongly opposed by the Volkstuinen associations. pass the rowing club Poseidon, and then you are back at the river bank. Ahead is the viaduct of the Utrechtse Brug, the start of the motorway to Utrecht. go under this viaduct, on the cycle path nearest the river (cycle sign for Centrum). The cycle path then rises to a cycle viaduct. The towers ahead are beside Amstel station, on the former Omval: compare Rembrandt’s view from the north with the present. cycle on past a former 19th-century gasworks and waterworks: the wooden lifting bridge is the entrance to its small dock basin. continue through a redeveloped former industrial area. At the main road (Spakler weg), turn left, towards the office towers. Here you join the return route of Route 5.
at the roundabout, continue along the cycle path between the towers, cycle sign for Centrum. pass (right) the Hogeschool van Amsterdam and the Amstel Station. Continue along the riverside road Weesperzijde. at the Ruysch straat, cross the tram line, continue past grander 19th-century riverside houses. cycle through an underpass, and pass the Amstel Hotel, the most prestigious in the city. Turn diagonally left, to rejoin the riverside road: here it is simply called ‘Amstel’. at the 19th-century bridge with lanterns, Blauwe Brug, the Amstel river bends west (left). Ahead is is Amstel 1 – the Town Hall and Opera complex, the end point of this route. This entry was posted in Cycle routes and tagged Amstelveen, Amsterdam, cycle route, cycling, Holland. Bookmark the permalink. Greatings! Nice posts and routes! Could you tell me if it’s possible to buy / download this routes for GPS? No, there is no suitable site to upload a combination of GPS and description. Commercial sites like abellife.nl offer routes with descriptions, but as far as I know there is no non-commercial equivalent. If you simply want to cycle in the region around Amsterdam, you don’t need really GPS or a map – there are enough cycle signs.